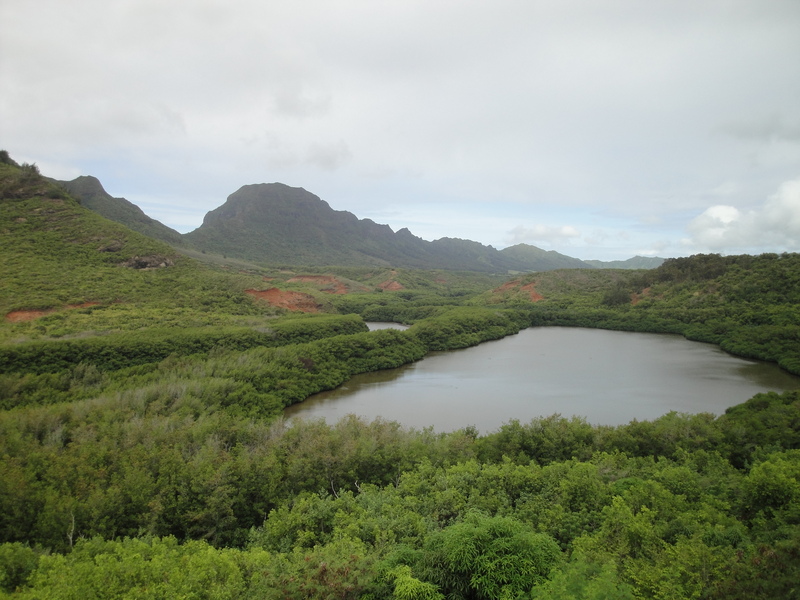 The Hulē‘ia River and surrounding wetlands are being severely overgrown by red mangrove (Rhizophora mangle). This is a species that is native to Florida and Virginia in the USA, but alien and highly invasive in Hawai‘i. 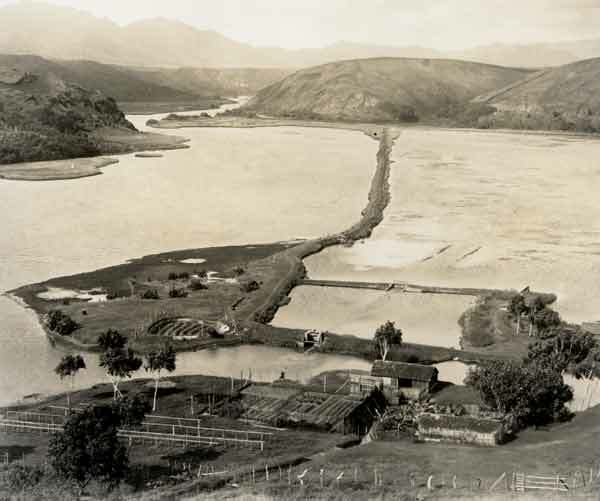 The severity of the red mangrove invasion of the Hulē‘ia River cannot be overstated. For more than two miles up the river, both banks are 100% overgrown by red mangrove, mature trees reaching 30 – 40 feet in height. Using Google satellite views, the mangrove trees appear to extend from the open river water inland up to about 450 feet in the worst areas. The Alekoko fishpond complex, which once consisted of ponds on both sides of the river, is now reduced to only one main pond that is entirely surrounded by the red mangrove. The main fishpond stone walls are completely buried under the mangrove roots, and circulation of water with the river is practically nonexistent. Again, when viewed from the river, one would never know that the fishpond exists if it were not for one small opening in the mangrove. 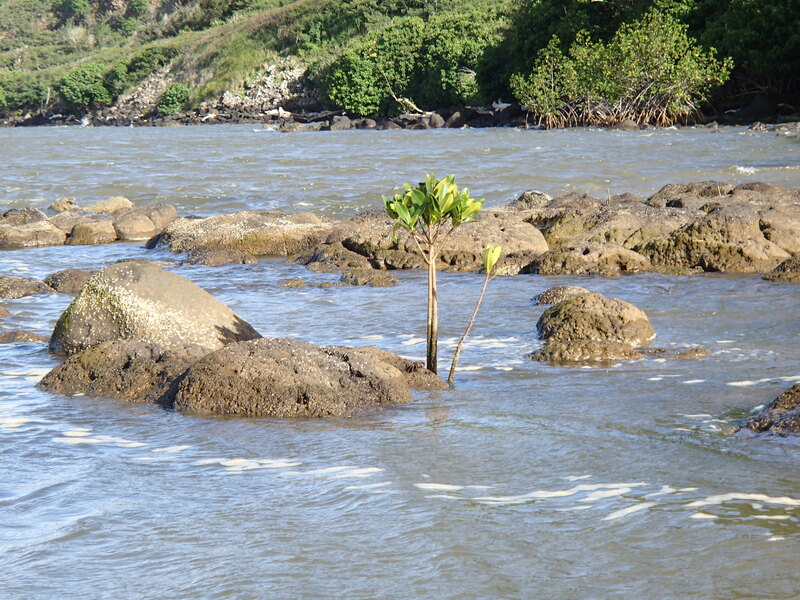 Further downstream, where the Hulē‘ia River is joined by the Pū‘ali Stream at the Niumalu Park, and where rock walls surround the Nawiliwili Small Boat Harbor and US Coast Guard Station, red mangrove has established new growth. The Division of Boating and Ocean Recreation has recently had to clear the mangrove growing on the rock walls of the Small Boat Harbor. 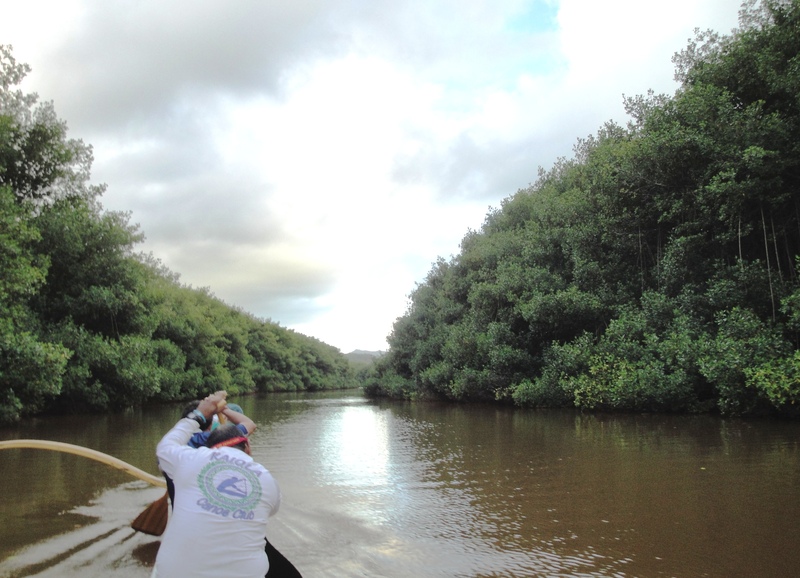 But the mangrove growing across the Pū‘ali Stream and Hulē‘ia River remains unchecked. Growth in the area next to the Kaiola Canoe Club and Niumalu Beach Park is already very dense and completely obscures the ocean views from the park. Further out, along the mouth of the river and even on the rocks of breakwater that protects the Nawiliwili Commercial Harbor, red mangrove propagules have found anchorage and are beginning to grow. 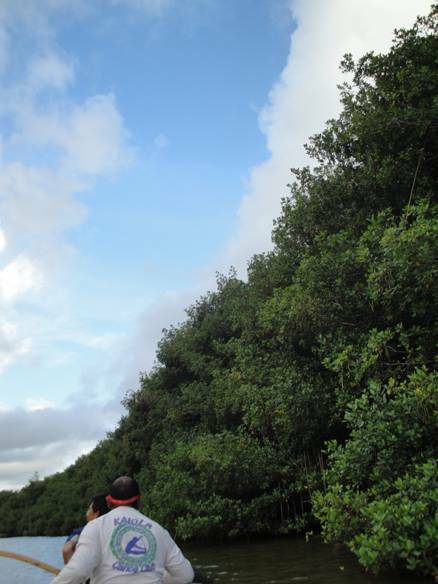 Someone helped the red mangrove to get from Florida to Molokai in 1902. Since then, the plant has used its own strategy to spread across the Hawaiian Islands and invade its preferred habitats. These habitats occur wherever fresh water mixes with salt water, including places like the marshes of the Hulē‘ia National Wildlife Refuge, the walls and mudflats around the Alekoko Fishpond, the rock walls surrounding the Nawiliwili Small Boat Harbor, and of course the banks of the Hulē‘ia River and Estuary. 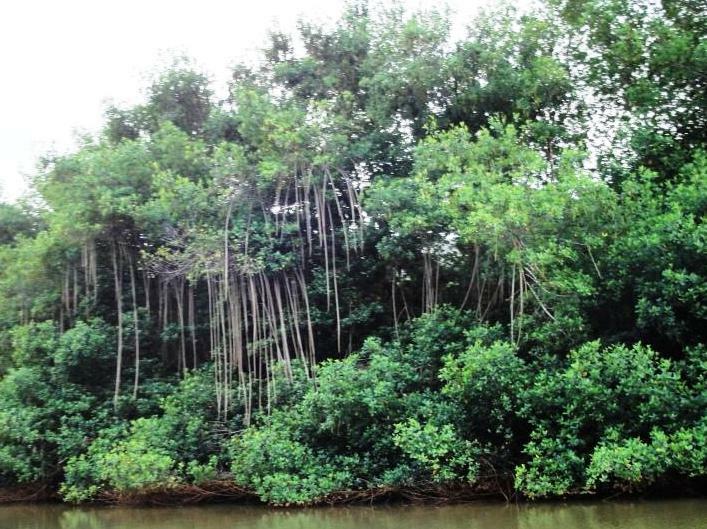 In the form of its propagules, red mangrove travels from island to island, and from one location on an island to another. These baby trees have the advantage of being a couple of steps ahead of the seeds spread by most plants, because they have already germinated while still hanging from their parent’s branches, and they already have the chlorophyll needed to make their own food. When released by their parents, the propagules fall into or are washed into the water and float with the currents in a vertical position until they reach a place they can call home. Home is wherever they can touch bottom and hold on long enough to set their roots and spread their branches. 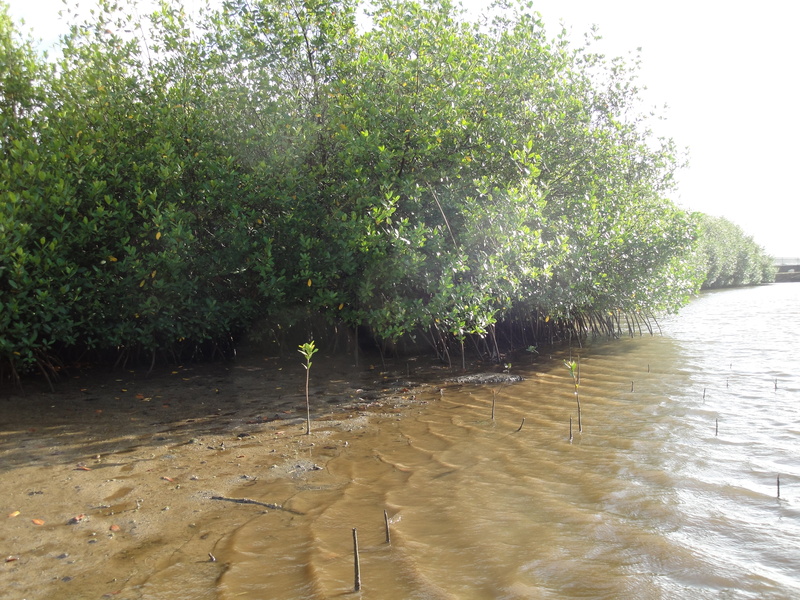 It may be a great distance and several months before the mangrove propagules find their homes, but once established, growth can be very rapid. Branches and roots work together to anchor the plants and enable them to spread horizontally as well as to grow vertically. Prop roots descend from branches high above the water. 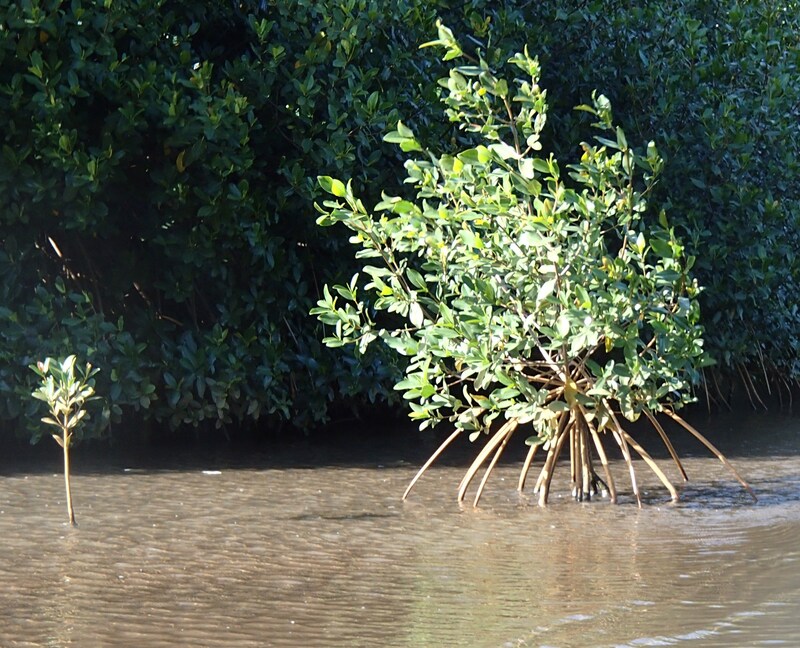 These roots stabilize the trees in soft and submerged ground, and allow the trees to breathe well even when they are situated in a dense jungle with stagnant water or rotting vegetation lacking in oxygen. 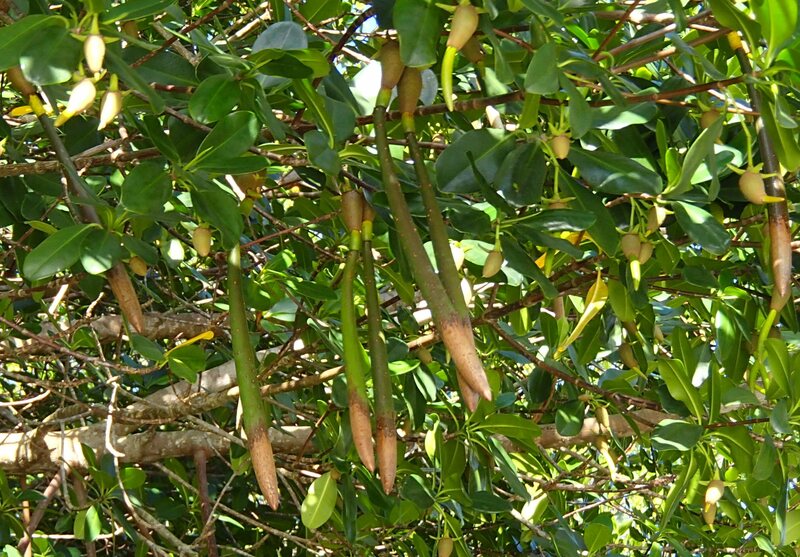 Clearly, red mangrove has been successful in its invasion of Hawaii, and especially of the Hulē‘ia River. It is time to turn back this invader. It is time for Mālama Hulē‘ia. Thank you for publishing these photos on the web.May I use one of them in a book I am writing? My need is just to provide a high-resolution photo of mangrove propagules, and the one I’m looking at would be perfect for my purpose. If you give permission, how shallI credit you? Please just credit our website. Thank you. Do you know where I could find data on how far spread they are today in terms of area coverage? (like total area of population)?